Looking for soft yet durable men’s crew neck shirts? Here’s the Bugatchi Fall 2014 collection. The “1000” fabric is the same as the famously soft “1643” 65% modal rayon, 35% polyester shirts Bugatchi is famous for, except it’s smooth instead of ribbed. ABOUT BUGATCHI: The BUGATCHI brand has evolved to exemplify a contemporary designer lifestyle with a complete look for men. Synonymous with the luxury of Italian fabrics and design aesthetic, BUGATCHI redefines discernment in menswear with its expansive collection of sportswear, furnishings, outerwear, and accessories. ABOUT CEOGOLFSHOP: CEOgolfshop, a Florida corporation, offers luxury men’s apparel, gifts, and custom executive products for discerning retail and wholesale customers. For the best product selection, customers are encouraged to advance order. Not all items are listed in the online store. Contact sales for special needs and bulk orders. Click here to shop online for Bugatchi. These shirts are from the 2013 2014 Bugatchi Uomo Fall and Winter collection and are all suitable for the golf course or under a sportcoat. Bugatchi is famous for shirts with incredibly soft fabrics with amazing tactile feel, that are long lasting. It’s not uncommon for customers to say they’ve been wearing the same favorite shirt for years and years. All are available in sizes small to 2XL. Custom logo embroidery is optional; call for quantity discount pricing, or check online. Some items will have a click for quantity pricing next to the purchase price. Traditional Bugatchi men’s 3 button t-shirt- long sleeve polo. With a wide variety of solid colors, this is the perfect company shirt to add your custom logo. Above: PCF1520K52, THREE BUTTON, FULL FASHION COLLAR, 100% pima cotton, over a dozen solid colors. MSRP $95. Buy online Bugatchi solid color t-shirt 1520. UPDATE- SOLD OUT. Advance order between April and June 2014 if you’d like this shirt next year. Bugatchi men’s 3 button shirt- long sleeve, self collar. PF2015F48, above. These shirts all have a contrast placket . Buy online Bugatchi PF2015F48 fancy knit shirt. UPDATE- SOLD OUT. Advance order between April and June 2014 if you’d like this shirt next year. PF2015F29, above. 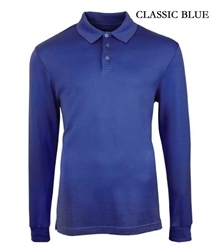 100% cotton, three button self collar. It’s difficult to see in the images, but these shirts all have special enhancements to the placket and shoulder. The shirts have a fashionable knit style that includes multiple darker color threads for a subtle contrast. Colors: charcoal, chocolate, emerald, grape, wine. Buy online Bugatchi PF2015F29 fancy knit shirt. UPDATE- SOLD OUT. Advance order between April and June 2014 if you’d like this shirt next year. Bugatchi men’s pin stripe knit shirt- long sleeve PF2005F77 PF2005F77 is designed for ease of movement with 95% cotton and 5% spandex. The pin stripe contrast and hidden button placket make this an incredible look. The fabric is so soft, I wish I you could feel it through your computer. MUST BUY for golfers! Buy online Bugatchi men’s pin stripe knit shirt- long sleeve PF2005F77. UPDATE- SOLD OUT. Advance order between April and June 2014 if you’d like this shirt next year. The last group below is made of smooth modal rayon, one of the brands softest fabrics, and a Bugatchi fan favorite. It drapes beautifully, and is great for travel since it’s wrinkle resistant. This Bugatchi T-shirt has a plaid contrast collar. MSRP $95. What is the darker color stripe in the Bugatchi thin stripe polo shirt? 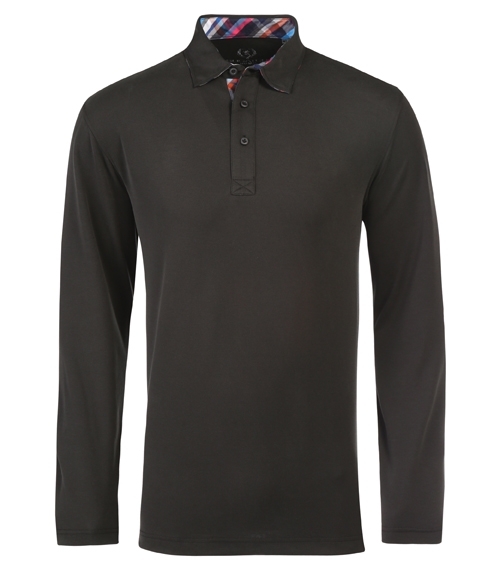 The darker stripe color is black in each of the more than dozen colors the shirt is made in. The buttons and collar are also black. Mercerized cotton stripe polo shirt. Oh so soft Egyptian cotton of the highest quality. Color that lasts, no pilling, and contemporary fit. Colors: chalk, cherry, classic blue, copper, mocha, platinum, royal, sage,cherry, classic blue, copper, mocha, platinum, royal, sage. Purchase online: Bugatchi Uomo Mercerized cotton stripe polo shirt Please note that our online store has a number of shirts in the ‘dress shirt’ category that will soon be moved over to the ‘sportswear’ category. We recommend click on BUGATCHI to sell al shirts within the brand.